Tuesday, April 13th, 2010 at 2:48 AM	|| Bishoujo Senshi Sailor Moon. I stumbled across this hella cute sketch of Seiya Kou and Tsukino Usagi while flipping through an ancient issue of Animage magazine! I had never seen this sketch before, but knew immediately that the image was no fan art. Animage featured an 18 page tribute to Bishoujo Senshi Sailor Moon, titled “Sayonara Sailor Moon,” because the long-running anime was officially ending that month. To express her personal gratitude for the series, one of the show’s key animators and character designers Tamegai Katsumi, submitted this sketch into the magazine. Many of you are definitely familiar with Tamegai Katsumi’s work. 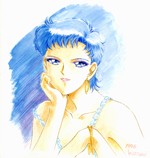 Aside from animating numerous arc episodes of the anime, she also had sketches that were published in official books of Sailor Moon. 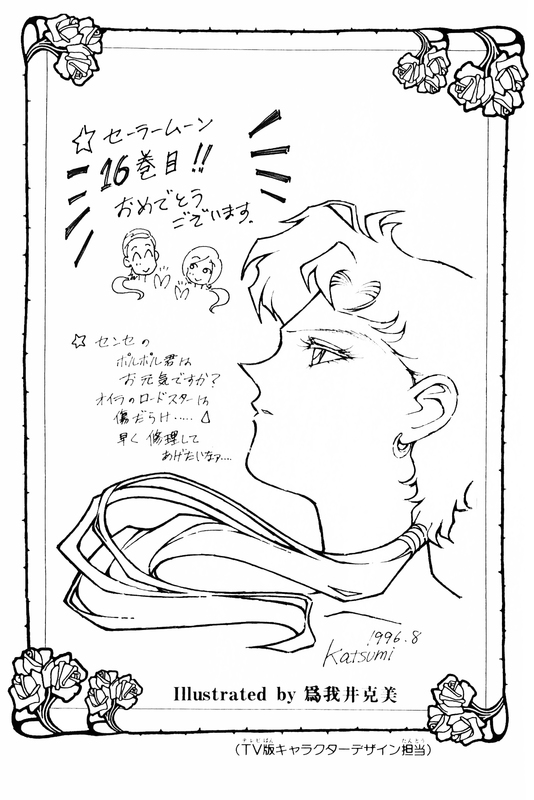 Towards the very back of the Sailor Moon Volume 16 manga, is a detailed sketch of Seiya Kou by Tamegai Katsumi. 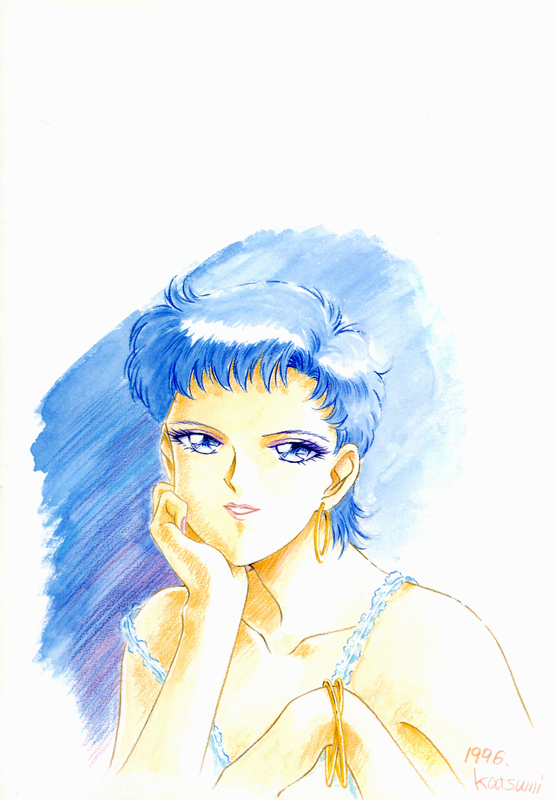 She also illustrated a delicate and colorful image of Seiya, that was published in Takeuchi Naoko’s Infinity Artbook. Finding this sketch of Seiya Kou and Tsukino Usagi really made my week. I’ve known for a long time that there are tons of character sketches and designs, that fans of Sailor Moon have never seen. Either because the makers decided not to release them, or because it was published in an obscure place. I’m really happy to have found this sketch. 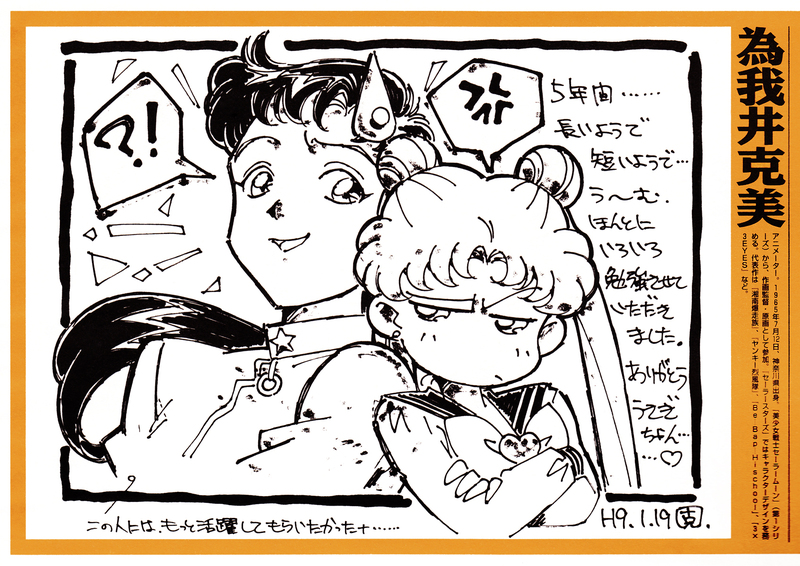 If you want to add this Seiya and Usagi sketch to your own collection, its in the March 1997 issue of Animage magazine (Volume 225), published in February 1997. GREAT FIND! Thanks so much for posting this!!! Oh! I’ve seen this one before actually, but it wasn’t from the March 1997 issue of Animage magazine- because I haven’t seen that mag at all XD I think it was at the back of one of the Sailor moon manga… which was in Chinese..
Great! i love sketches made by character designers. My favourite is Ikuko Itoh. If you own that “Sayonara Sailor Moon” special issue, could you upload it, please? Thanks for sharing! This stuff is seriously adorable, cute overload!! @ Jim – Hey Jim! I will scan in the “Sayonara Sailor Moon” issue, when I have more time. Honestly though, the article is mostly text. Like, 18 pages filled with small text. It has interviews with Sailor Moon’s directors, and short interviews with all the voice actresses of the Sailor Moon characters; including the Starlights’ voice actresses. There are little to no pictures with the article though. I was hoping to ask other sites, if they wanted to translate it eventually. But haven’t given much thought into yet. @ Elly – EEELLLLLLYYYYYY!!! -hug hug!- I’m glad you like it! >__< I thought it was amazingly cute too!! Wish it was a full drawing with color and stuff, but still so adorable! @ Chibi – Haha. Its okay! I do that too. I forget certain things that I think I totally positively remember. -huggles- Thank you for trying to help me track that down though! Maybe we’ll both come in contact with it some day!